Read my latest contribution to Studio G – the Gateway Women’s Magazine – about the power of passion to change your life. Bravely digging around in the deeply rooted places of your heart, will launch you on a journey of self discovery that will change everything. Click here for the Winter 2016 Edition and read Dig a Little Deeper. Life can be difficult. Sometimes the difficulties we face are not a result of our bad decisions or even the bad decisions of others. Sometimes life is just hard. Recently I visited with my dear friend, Chrystal Hurst Evans and shared on her podcast about how to trust God when you are living through a hard season. Chrystal is a passionate preacher, author, mentor and mom of five. You’ll want to check out all her content while you are there. Here’s the direct link to listen to Trusting God when Life is Tough. If you are struggling with adversity of any kind, you will be encouraged. I recently sat down with Dr. Robb Brewer, Executive Pastor of Equipping at Gateway Church, to have a conversation about leadership. Robb hosts a podcast called Mentoring Deep at Gateway Church. Here’s the direct link to listen to the podcast on How to Lead Through Cancer. In this episode I am sharing my testimony and about what God is teaching me in the moment. You will be able to draw principles from our conversation to apply to your own journey. I’m so excited to share with you an excerpt from Women at War that recently appeared in SpiritLed Woman magazine. I’m sharing about what happens when our deepest wounds and most painful experiences happen right in our own families. You can order your own copy of this edition or subscribe to the magazine by clicking here. Thanks SpiritLed Woman for your support. I am such a fan of Dr. Caroline Leaf. Her materials have taught me so much about my authority as a believer. I’m very honored to have shared a portion of my testimony on her television show “Switch on Your Brain” which airs on TBN. Her current teaching series is on mind and mental health. I am featured on week #4 called Disease and Disorder which aired February 17, 2016. You can find my testimony at about minute 19 – but don’t just skip ahead. This is good stuff! I’m listening again because I need a strong and healthy mind to cooperate with my spirit to produce a strong and healthy body. I bet you do too. Enjoy! Joni Table Talk – On January 4, 2016 I shared with my friend, Joni Lamb, on the Daystar Network show Joni Table Talk. We had a great conversation about female relationships. Click here to view the episode on-demand. I am proud to share with you my book on healthy female relationships called Women at War. A couple of years ago, I wrote a book called Women at War that’s all about revealing the schemes of our enemy to keep women despising our gender and rejecting our strength. You can click here to visit JanGreenwood.com and receive a free chapter, order a copy or an e-book, and share this resource with your friends. 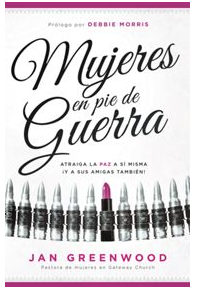 This book is also available in spanish under the title of Mujeres en pie de Guerra. Check out this book review by Katie M. Reid on her blog “finding grace in the unraveling”. Katie shared during her 31 day Restoration Project. Check out her Periscope discussion too. Thanks Katie for the review. A couple of times I’ve had the honor of sharing at the annual women’s conference of Gateway Church called Pink Impact. In 2013, I shared a message called One. God had been speaking to me about the power of unity and giving me a vision for a national revival that could begin with women who love one another and love the local church. I believe! Click here for the the youtube clip #1 and here for clip #2. 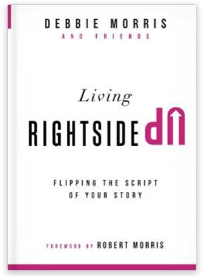 In the newest book by Debbie Morris and The Gateway Pink team, I share about overcoming adversity. Drawing upon my battle with breast cancer, I share some keys to help you navigate in the midst of your own challenging seasons. You can purchase this book by visiting the Gateway Church Bookstore or any on-line or local Christian book store. 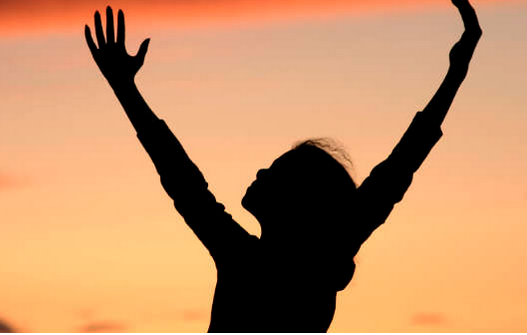 I also enjoy occasionally writing for a great on-line magazine called Kingdom Life Now. I write about topics related to women in leadership. Here’s are some links to my recent contributions. 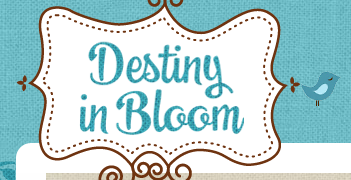 Here’s a blog I wrote for a great online magazine Called Destiny in Bloom in 2011, only two years after my diagnosis with breast cancer. My counsel is still good today. 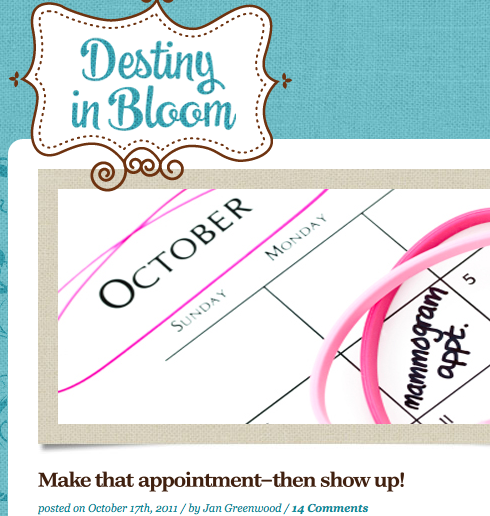 Please take a moment to read and then make your own appointment for a mammogram – because early detection will save your life.